Well, it's here. The fresh start of a new year. Like many others, I always love the freeing feeling of beginning a new year. It seems like everyone is ready to be done with 2016 (that's all I'm seeing on my Instagram and Facebook pages), and aside from all of the sad and depressing stuff that went on in the world in general in the past year, I felt like I personally had a pretty good year. We had some exciting new purchases (a new truck and camper - Yay! ), I quit eating meat (and most other animal products), I got back into reading again, and a lot of other small things that add up to me feeling like this year was more positive than negative. I'm not necessarily into setting "New Year Resolutions", but I always like to be a little introspective at this time of year, and think about things that I'd like to accomplish. 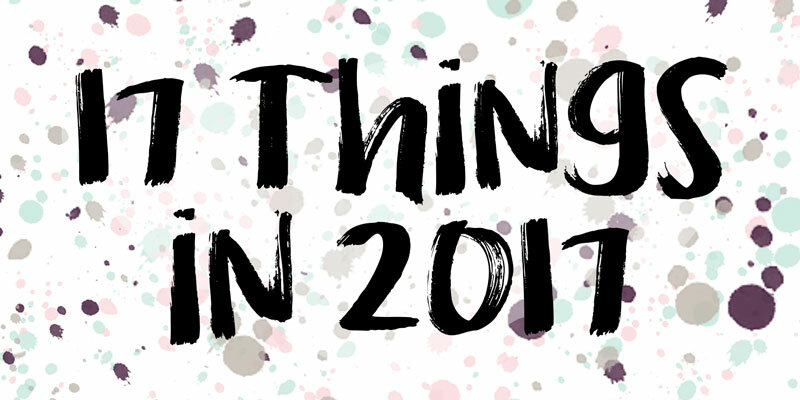 So, with that, I've come up with a list of "17 Things in 2017". These are things that I want to do or accomplish, or goals to work towards - big, small, and anything in between. Read 30 books. Years ago this would have been a laughable goal - I'd be done it in a couple of months. However, with life right now, I feel this is more realistic. Aiming for about two/month, with a few extra thrown in there. Start the year off with a three-month spending freeze. I've been buying so much stuff lately (mostly scrapbooking related) that is just sitting around and not getting used. Time to start using it, and stop buying more! But for good measure, I'm applying the freeze to all areas of my 'personal spending'. Start employing the "one-minute rule". I first heard about this on Gretchen Rubin's "Happier" podcast, and the idea is to immediately do any task that can be finished in one minute, instead of putting it off. Ie, hang up my coat, answer an email, put a dish in the dishwasher, make the bed, put my clothes in the hamper (instead of in a pile on the floor). I've become a little tidier in the past year, and I'm hoping this will help make a bigger dent in the clutter around the house. Blog at least once a week. Ideally, I'd like to do more... but I'll start small and attainable. Have a weekend getaway without the kids. I'd love to get out west to the mountains... maybe Banff or something. "The Mountains Are Calling, and I Must Go" - this quote is me right now. It's been a few years since we've been out to the mountains, and I just feel like I need to get out there and be in them again. And it'll just fill this little hole in me. Start doing yoga at home. This has been on my list of things to do/start for like, three years, but I'm just gonna keep adding it until it happens! After some searching, I found this Youtube channel, Yoga with Adriene, that lots of people say is good, so I'm gonna give that a try! Make one new dinner recipe a month. Since switching to eating vegetarian/vegan, I need to start building up some go-to meals. I rely a lot on soups, wraps, quesadillas, etc. since they're pretty easy and quick, which is handy when Jason is away. But I want to add some fuller, hearty meals into the rotation as well. Work on mindfulness with the kids (and myself). Right now Austen is in the throes of the Terrible Twos... and some days are definitely terrible (understatement). I think all of us, but he especially will benefit from being more mindful. He's our temperamental little wild child, prone to fits, tantrums and just general craziness. Hoping to bring a little more peace to our household this year. Go through my phone photos nightly to review and cull. Especially now that I have a newer iPhone with a great camera, I'm taking so many more phone photos. Add to that that I often take like, 10 photos of the kids at once to maximize my chances of getting a decent one, I end up a with a lot of photos on my phone - most of which are duplicates/garbage ones. Get a handle on all of the photos/videos on my laptop and on our family desktop. Piggy-backing off of my above goal, I need to get all my photos under control. Between my laptop and our desktop, I probably have 70,000+ photos... half of which are probably garbage or duplicates. Gotta come up with an easy and manageable system to get those under control. Do some puzzles! I got a sweet Harry Potter puzzle for Christmas, so I'll start out with that one. There are so many cool ones out there! I want something relaxing but 'productive', besides reading, to do in the evenings once the boys are in bed. Buy and build the Lego Disney Castle. This probably seems super random (and it is), but when this lego set came out a couple of months ago the little kid in me just wanted it so badly. The boys aren't really into Lego yet, but I'm hoping they will be once it's a little more age appropriate - there are so many cool sets out there! JJ would just love to have a version of "The Castle" in our house! Continue to overhaul my wardrobe and add classic, timeless pieces to it. In the past year or so I've been working on getting rid of clothes that don't fit me or that I just don't wear while trying to add some nice, high-quality things into the mix. Continue to practice hand lettering. This is a hobby that I practice in such spurts... I'll letter nightly for a couple weeks, then not touch it for months. I want to try to be a little more consistent with it. Handwriting is always something I've loved, and I find it to be so relaxing. Get my email under control. As I'm writing this I currently have 1013 unread emails in my inbox. 😳 Almost all of it is junk mail that I let pile up and pile up instead of just deleting it (or unsubscribing). I do use the unroll.me app, but obviously not well. It's my dream to be one of those people that have an empty inbox at the end of every day. I'm not counting on that happening anytime soon, but I need to get this mess under control. Scrapbooking/memory-keeping. Come up with a plan of what projects I want to take on this year, what ones I want to finish up that are already started, and how to better fit scrapbooking into my life right now. Last year I didn't accomplish as much as I would have liked - partially because I just wasn't "feeling it" at times, partially because I'd get so sidetracked looking for 'inspiration' that I wouldn't actually accomplish anything, and partially because my scraproom is such a mess, and I have too much stuff that I didn't know where to start. I need to figure out a sustainable plan and stick to it. Have two date nights/month with Jason. This doesn't have to mean getting out of the house for dates necessarily (although that's great too! ), but at least two dedicated nights where it is us hanging out, with each other's undivided attention. So that's actually 18 things for 2017, but that last one just came to me, and I feel it's something really important, and that we need. So, a lot of stuff to be working on and thinking about this upcoming year! I'm excited for this fresh new year, and all the energy it brings. Time to get cracking! What are some things you hope to accomplish in 2017?